If you’ve ever wondered how much your car boot sale bargains or loft clutter might be worth, now is your chance to find out. Flog It, the popular BBC One antiques programme presented by Paul Martin, is coming to Southwell Minster on Thursday 30 January 2014. Now on its 13th series, the major BBC antiques show regularly achieves an audience of more than two million viewers in its weekday afternoon slot. 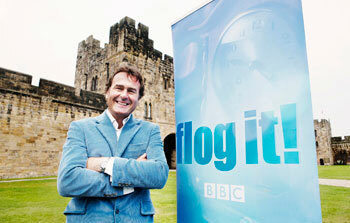 The Minster will be hosting the Flog It valuation day. Rather like a treasure hunt, members of the public are invited to bring along up to three antiques and collectables they might be interested in selling. Once valued, the owner and a team of experts decide whether an item should go forward for auction. If the item is chosen it is included in a sale a few weeks later – hopefully when the auctioneer’s hammer falls its owners make a tidy sum. Everyone who goes along to the valuation day will receive a free valuation – even if their antiques are not chosen to go forward for auction. Last year the show made a significant find when a rare Aboriginal Broad Shield that had been kept hidden away in a Flog It viewers’ wardrobe was brought along to a valuation day in North Lincolnshire and went on to sell at auction for £30,000! The series also uncovered an unusual Royal Doulton Spook figurine in Blackpool which had been bought at a car boot sale for £2; it went on to sell at auction for £5000. Paul Martin will be joined on the valuation day by Flog It on screen experts Michael Baggott, Caroline Hawley and Mark Stacey. Flog It will be at Southwell Minster, Church Road, Southwell, Nottinghamshire, NG25 OHD on Thursday 30 January 2014 between 10am and 4.30pm. The items selected at the valuation day will go under the hammer at Mellors and Kirk, The Auction House, Gregory Street, Nottingham, NG7 2NL on Wednesday 19 February 2014.